Harold Norman Ward passed away on July 13, 2018, at the age of 93. He was a lifelong resident of Monroe, NH, who spent winters in his home in North Port, Florida. The son of Hazel G. Smith Ward and Robert F. Ward, he was born on March 20, 1925. Norman was a dairy farmer to the end. During his last few weeks, he was more concerned that he wasn't on the farm helping his long-time farming partner and son, Paul, put in hay than he was about anything else. 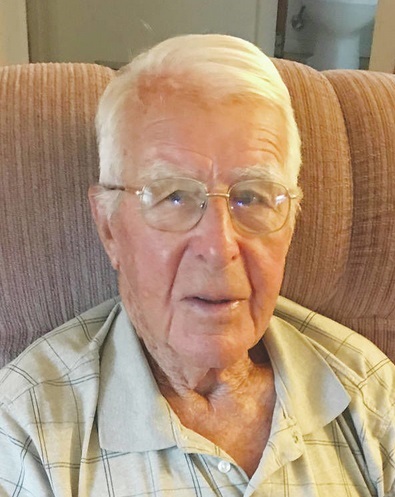 Over the years, he won several awards for his work as a dairy farmer and served on many agricultural boards. He was especially proud of his prize-winning herd of Jersey cows. He served on town offices, was active in community affairs, and was a long-time member of organizations such as the Grange and New Hampshire Farm Bureau. He was a devout member of the United Methodist Church in Monroe and worked on church activities such as the Lords Acre Auction that is held every fall. One of his greatest loves was playing the trumpet. He started as a small boy, teaching himself to play the trumpet, which his older brother, Philip, hated. In the 4th grade, his lifelong music teacher and role model, George McClure, was delighted to have a student who could already play well. He played with the McClure Student Band while in school and since has played with the Groton Vermont Band, the McClure's Alumni Band, and the St. Johnsbury Band (VT). As a high school farm boy, playing at the 1939 New York World's Fair was one of his most prized memories. Once he was semi-retired and became a snowbird, he spent his winters in Florida playing with the North Port Concert Band, the Charlotte County Concert Band, the Port Charlotte Orchestra, and the Sun Coast Wind Ensemble. He practiced with one of the bands the week prior to his passing. In Florida, Norman and friend Cindy Patridge, travelled to and played together in the bands. They also played their trumpets at Norman's house on Tuesdays. Cindy always baked a sweet treat (pie, cake, cobbler), they would eagerly gobble some of it, and then play trumpet duets together on what they called "Trumpet Tootin' Tuesdays". They always ended their duet time with "Put On A Happy Face". Norman rode his bike 8.6 miles every morning until about a month before his passing. With no farm work in Florida, he had extra time and would often take a second or even a third shorter ride later in the day. Norman and Cindy would frequently hike to his mountain pond on Scarrit Mountain (NH) where he owned 200 acres in addition to his farm land. They played together in the St. Johnsbury Band and went to the Band's annual picnics together. Norman married Eva Wilson in 1947 and for 68 years, they lived together until Eva's passing on July 8, 2015. He was also predeceased by four brothers and a sister: Linfield, Leslie, Philip, Homer, and Mary Stanton. He is survived by sons, all living in Monroe, Robert Ward, Gordon Ward and wife Sandra, Denis Ward and wife Jeanne, and Paul Ward, as well as daughter Sandra Kaskey and her husband Paul, who reside in North Port, Florida. He has 10 grandchildren and 12 great-grandchildren and numerous nieces and nephews. A graveside service was held on August 4, 2018 at the North Monroe Cemetery.